This story is from the November 2004 issue of Motocross Action Magazine. 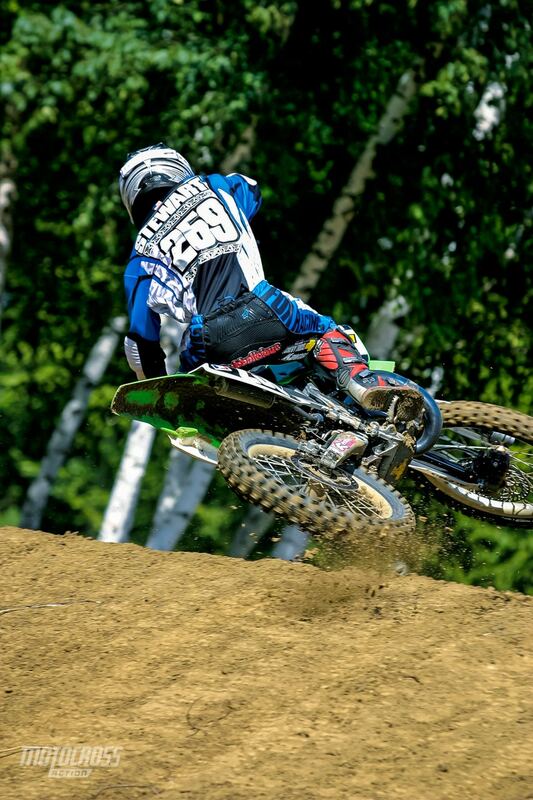 Have you seen very many KX125s racing around your local track lately? Unfortunately, we haven’t either. We do know that there is one kid doing pretty well on a KX125 in the AMA 125 Nationals, but his magic hasn’t translated into a lot of copycats with money. 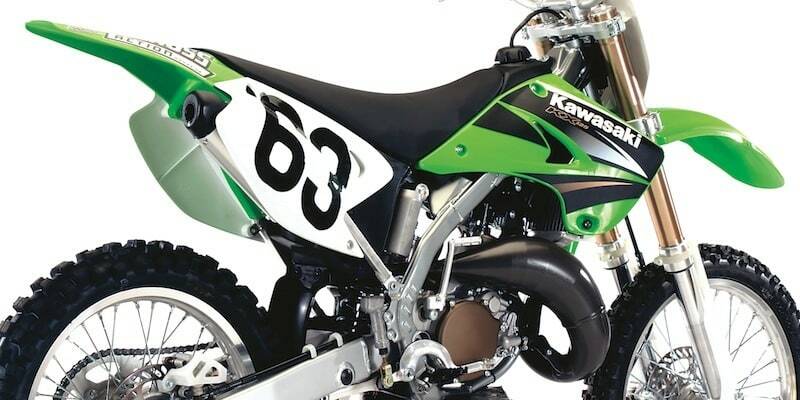 Why aren’t herds of young racers rushing out to buy James Stewart replica KX125s? That’s simple. Modern racers don’t pay attention to race results any more. Ricky Carmichael didn’t sell any CR250s for Honda, and Bubba hasn’t sealed the deal for the KX125. We live in a four-stroke world and the masses want to buy thumpers–and, statistically speaking, Ivan Tedesco sold about 50 percent more of his machine than James Stewart did of his. Which leaves Kawasaki with a lot of unanswered questions. Is the 125 two-stroke a lost cause? Does it have enough power to run with the four-strokes? Did the engineers fix the handling flaws that plagued last year’s machine? Does the 2005 KX125 have anything to offer over the KX250F? If professional racers don’t sell motorcycles, how much money should a motorcycle manufacturer be paying them? Without further ado, we give you the answers. Q: HOW DOES THE 2005 KX125 DIFFER FROM THE 2004 KX125? A: Come on, you’ve seen the new graphics. They’re different. Okay, not a ton different. But to the discriminating eye, they do differentiate a 2004 from a 2005. Not much else has changed. Here is a complete list: (1) The seat is taller in the middle and has stiffer foam. (2) The right fork guard has been reshaped for fender clearance. (3) The rear brake pedal is mounted with a larger bolt. That’s it. This is the 2004 KX125. Other than BNG for 2005 the KX125 got a taller seat, reshaped right fork guard and the rear brake was mounted with a larger bolt. Q: HOW DOES THE 2005 ENGINE COMPARE TO THE 2004? A: It’s a little faster. If they didn’t make any changes, then how did they make it faster? Good question. The majority of mods that the 2005 engine received were for reliability issues. The left crankcase has been revised to allow more oil to reach the input shaft bearing. The reed valve guide was made more rigid and heat resistant to lessen heat deformation. The transmission input shaft is 2mm larger. The Mikuni TMX38X carburetor has a fuel collection chamber added to the pilot jet. And, last but not least, the ignition has a waterproof coupler on the ignition coil. The right fork guard was reshaped demo 2004 to 2005 for fender clearance. We can’t blame Kawasaki for soft pedaling the 2005 modification program. After all, they made a ton of changes to the 2004 model, and the 2004 model was really fast. By not messing with any of those changes, they made sure the 2005 KX125 is still really fast. But why is it faster than last year? We think that Kawasaki changed the maps on the ignition system, but they don’t have info to confirm our suspicions. Q: WHAT DOES IT FEEL LIKE OUT ON THE TRACK? A: It’s fast. We’ve spent the last month tearing around the track on Yamaha’s all-new YZ125, and we must admit that the 2005 KX125 is faster than the Yamaha in a drag race. 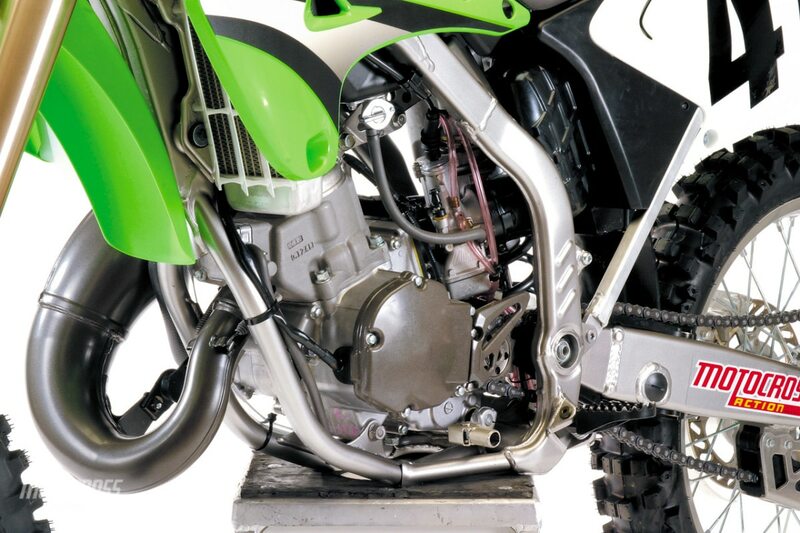 With all the modifications Kawasaki made in 2004, the KX125 has a pretty sweet powerplant. It is still a little doggy off the bottom, but it comes on really hard in the middle and, thanks to the new ignition mapping, pulls farther on top than it did in 2004. 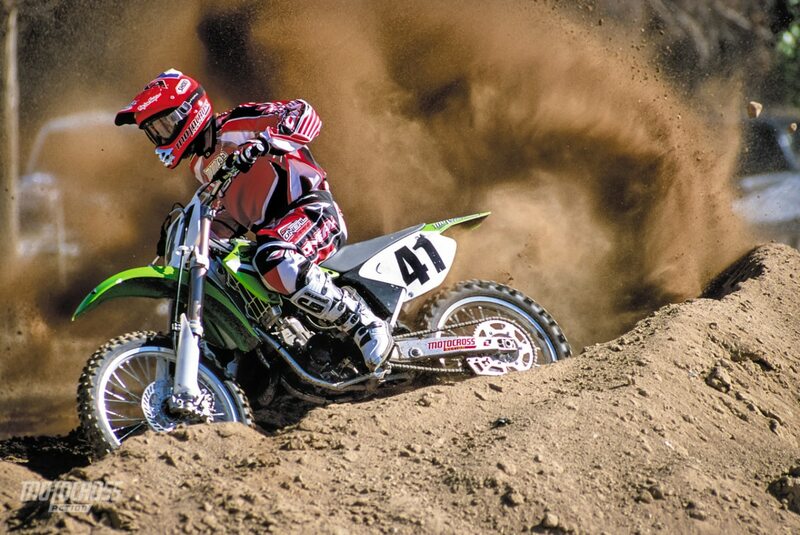 The 2005 KX125 is a fast 125cc two-stroke, make no mistake about it. It can run with any 125cc two-stroke made and has a fighting chance against the thumpers. The 2005 KX125 was faster than the 2005 Yamaha YZ125 in a drag race. Q: CAN GEARING HELP THE BOTTOM END? A: Absolutely. We drop kicked the 51-tooth rear sprocket in favor of a 52, and the KX125 couldn’t have been happier. The lower gearing stopped us from fanning the clutch to get out of corners in second. It made second gear more usable, which translated into a seamless transition to third (and less clutch abuse). Q: DID KAWASAKI RENOVATE THE SUSPENSION FOR 2005? A: No. 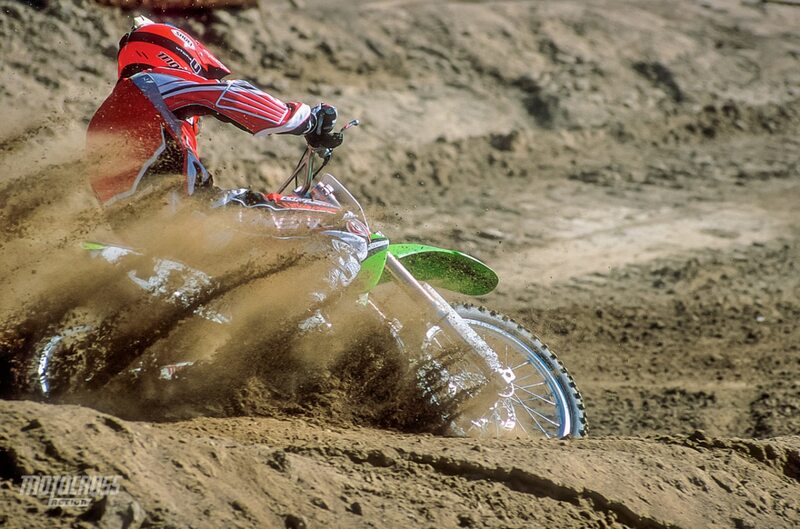 One of Kawasaki’s major flaws in 2004 was the suspension setup. It was unbalanced–in a psychotic sort of way. Unfortunately, the 2005 suspension didn’t benefit from any remedial help. The only change to the suspension was new low-friction oil seals in the forks (in our opinion, this will probably translate into more blown fork seals). Everything we said about the 2004 suspension still applies in 2005. Q: WHAT IS WRONG WITH THE KX125 SUSPENSION SETUP? A: The rear feels really high and the front feels really low. Classic stinkbug. On the track, this setup translates into a very busy front end (head shake, oversteer, wandering and twitch). Meanwhile, the rear end stays high, which contributes to its tendency to kick over braking bumps and pack on landings. Q: IS THERE A WAY TO FIX THE KX125 SETUP? A: Yes. There are two ways to fix the KX125–cheap and expensive. Cheap: Slide the forks down into the triple clamps until they are flush with the top of the clamp. Set the front fork compression on 14 clicks out. Measure the race sag and set it at 105mm. Now, go ride the bike. If the back still feels high, you can go as far as 110mm of sag (don’t go beyond 110mm). Adjust the shock’s compression and rebound (starting with the stock settings). Expensive: The Tiffany setup is to install Pro Circuit’s works linkage. It comes straight off the bikes of Stewart, Tedesco, Roncada and Walker. It changes the ride height, rising rate and feel of the back of the bike. You will still have to fiddle with the front fork height and clicker settings, but the $450 linkage turns the otherwise unbalanced KX125 into a balanced piece of machinery. 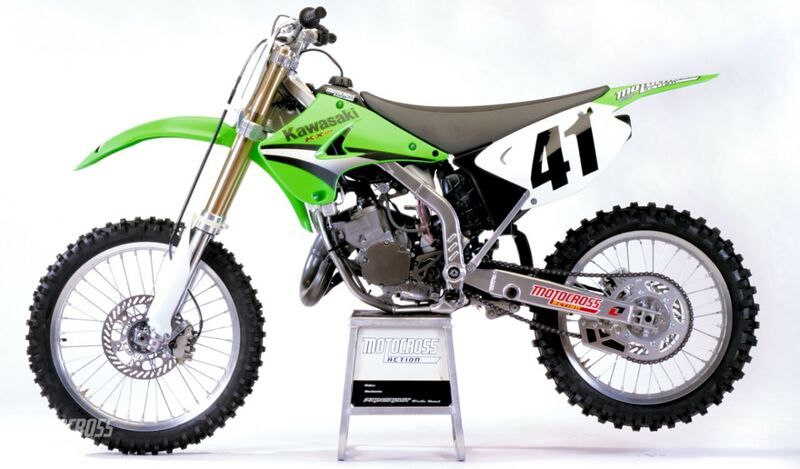 (1) Balance: The KX125 felt out of balance in 2004, and, since they didn’t change a thing for 2005, it still does. (2) Handlebars: With Honda, Yamaha, Suzuki and KTM all jumping on the aluminum bandwagon, Kawasaki is the sole steel holdout. (3) Shock: The setting is still too stiff for the average 150 pound 125 pilot. (4) Clutch perch: Didn’t Kawasaki get the memo about on-the-fly clutch perches? They are the only manufacturer not to have one. (5) Graphics: The least Kawasaki could have done was made them look radically different from 2004. (1) Power: The bike is fast. It comes on super strong in the middle and revs to the moon. 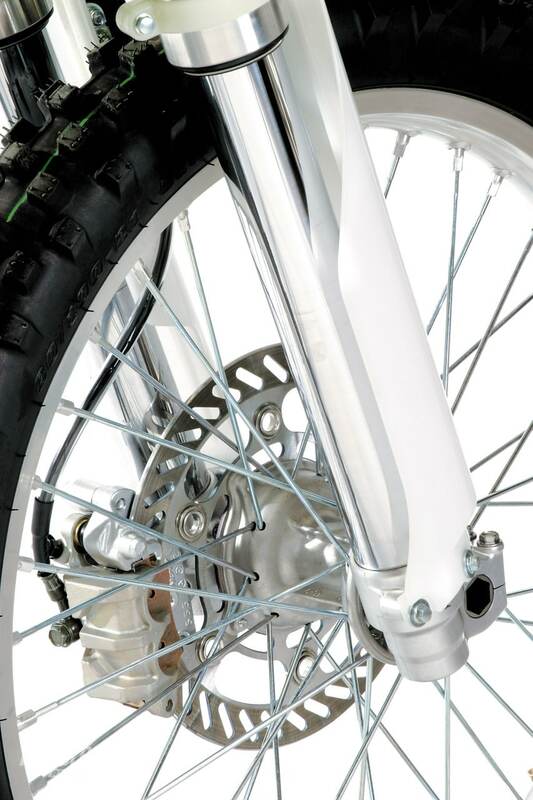 (2) Front brake: With Honda-style brake hose routing and new pad material, the front brake has pucker power. (3) Maintenance: We had forgotten how easy it is to work on a 125cc two-stroke. Kawasaki’s perimeter frame makes everything easily accessible. (4) Tires. Last year it came with hard pack-oriented Dunlop D739s. This year, Kawasaki switched to the more intermediate-friendly Dunlop D742 and D756 combination (although we would have preferred a 756 front over the 742). A: BNG. Ever heard the phrase? BNG is industry-speak for “Bold New Graphics” (which means that the bike is unchanged except for the decals). Historically, minicycles, play bikes and Open class two-strokes have been the recipients of BNG—not premier race bikes. 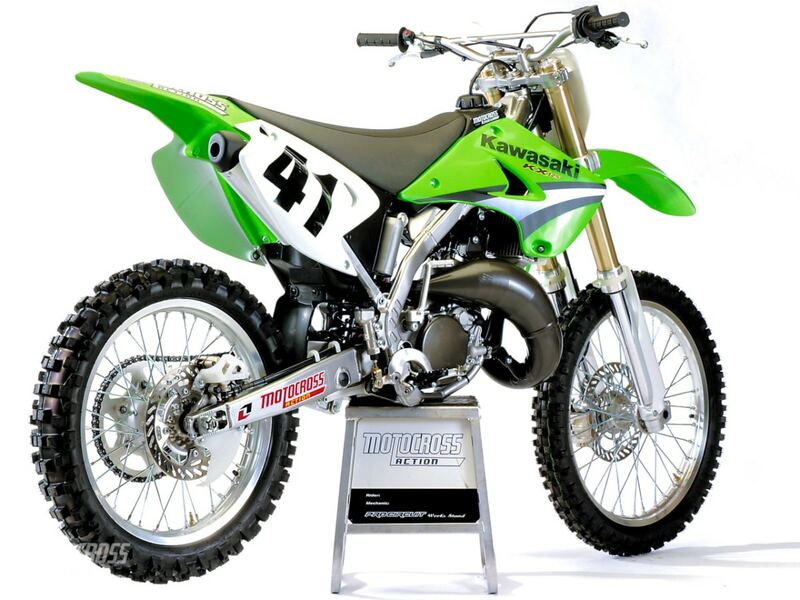 Let’s hope the 2005 Kawasaki KX125 isn’t the start of this trend for competition two-strokes. THURSDAY AT GLEN HELEN: DID YOU THINK NO ONE WOULD BE THERE?